It’s Spring Time here in Texas! The weather is already warm and bluebonnets are blooming all over the highways and fields. I love this time of year in Texas!! Coconut Cake always reminds me of Spring Time or Easter. 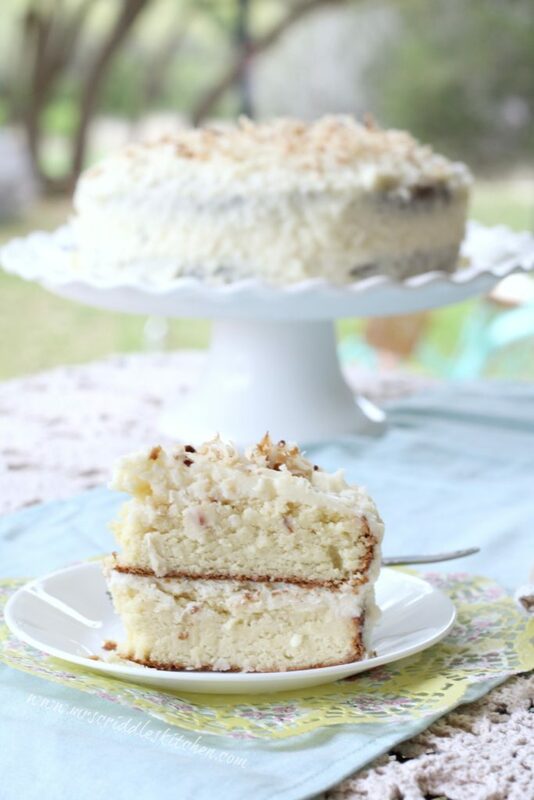 My grandmother always made a coconut cake for Easter. I also got my love of cooking/baking from her! 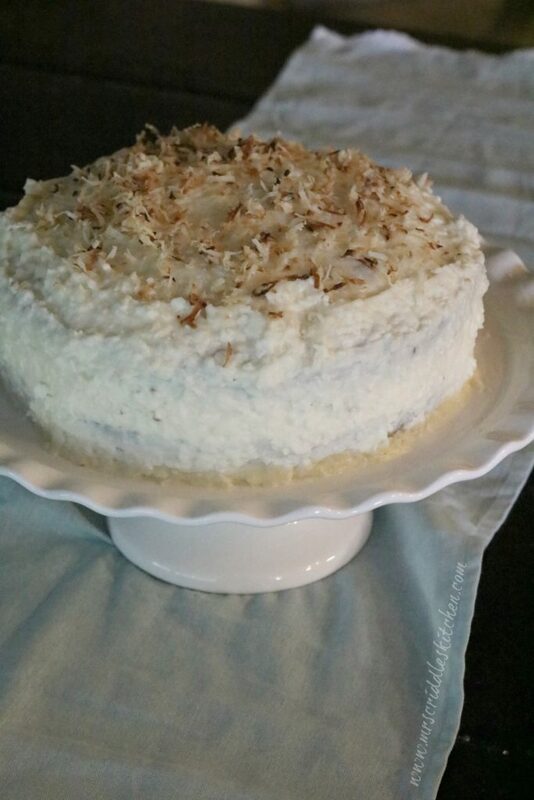 So here is my version of a Trim Healthy Mama Coconut Cake! My whole family enjoyed this cake, right down to my baby girl. In fact, the day I was trying to take pictures of my cake to post to my blog, I was swarmed by my kids beggingfor another piece! But it makes me happy knowing I can feed it to them with out a sugar-crazed scene later! No harmful sugar effects for any of us! 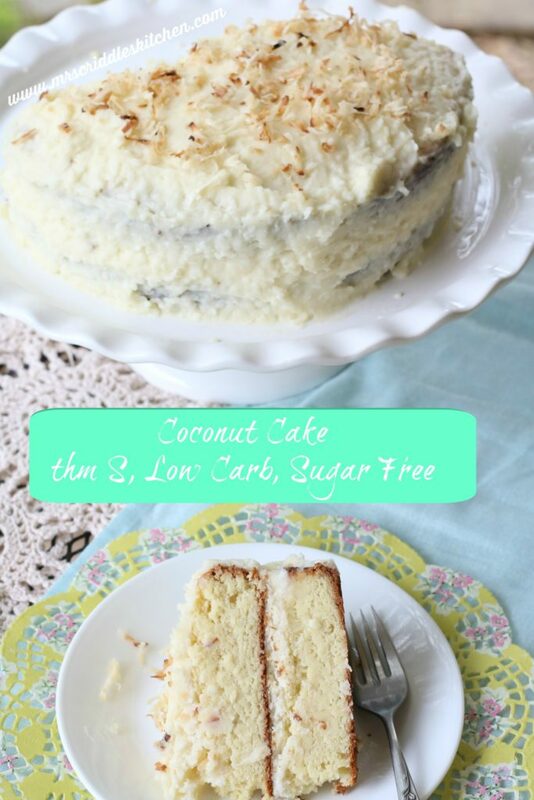 I did use almond & oat fiber for this cake and use coconut oil to give it flavor. **If you do not have oat fiber you can add about 1/3 to 1/2 cup of coconut flour in it’s place to give it that bulk. Be sure to just scoop and shake the coconut flour. 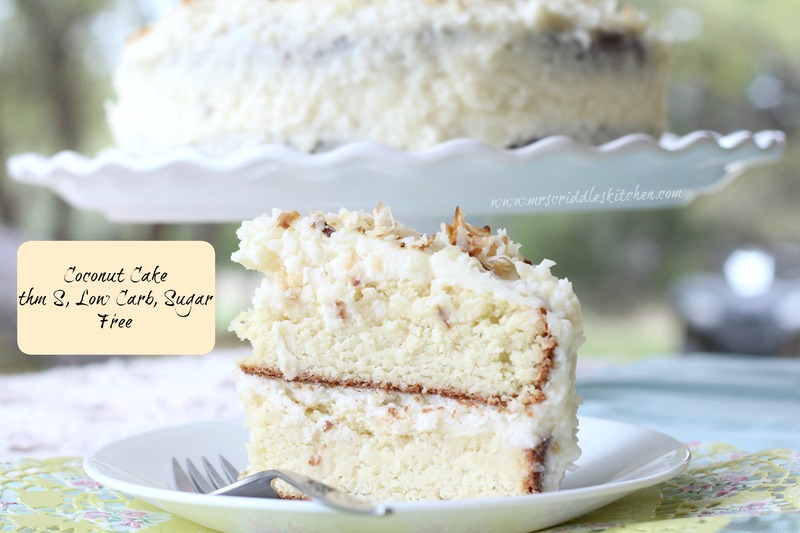 But I love this cake… it makes a great vanilla cake base for other cakes! I hope you will give this cake a try! It’s low carb, THM S, and sugar free. A sugar free coconut cake perfect for Spring! With all that yummy taste of “real” sugar! 1 cup of oat fiber (if you do not have this you can try using about 1/3 to 1/2 cup of coconut flour instead… try the smaller amount first). **Optional, if you want to add more bulk to frosting you can add about 1/2 cup of coconut cream. Spray two 8″ round baking pans with coconut oil spray or coat with butter. Place parchment paper at the bottom of coated pans. Spray with coconut oil spray or butter. Mix butter and sweetener, vanilla & almond flavor together till fluffy. Add sour cream and coconut oil and mix. Add all the dry ingredients. Scoop batter evenly into each coated pan. Place in oven to bake for 25-30 minutes. Check at around 20 minutes. Take out if cakes come out clean when tested with a knife or toothpick. For frosting mix butter, cream cheese and sweetener together well. Add in the flavorings. heavy whip and 3/4 cup of the coconut shreds (you can add all the coconut if you do not want to toast any coconut for the top). Take cakes out and allow to cool completely before icing. Place one of the cakes on a cake stand. Place the other cake on top of the frosting. Frost the top and sides. Toast up the 1/4 a cup of coconut shreds in a skillet with 2 tsps. of butter and 1 tbsp. sweetener. Mix until it browns nicely. Place on a napkin to get off excess butter. Sprinkle on top of cake. PS… I made a revision to this cake because I had added coconut flour to the list by mistake but didn’t actually use it. Sub for oat fiber? Coconut is my favorite! Hmmm, I would probably add about 1/4 cup more coconut flour… but I have not tried it, that’s just what I would do! Any subs for sour cream? Can we use baking blend? I have not tried it… but if I did I would probably just use 2 cups straight Baking Blend instead of all the other flours. BUT, I have not tried it so I am not 100% on this! I have one in the oven now with 2 C Baking Blend. However, I also used 1 C oat flour. Batter was dry – of course! I added half and half to get a thick batter. It looks promising! Why does the coconut flour need to be softened? Is that supposed to be something else? Is the batter supposed to be really thick? I was thinking not since it says pour into pans. It’s like a thick oatmeal. I’ve double checked the ingredients list twice I didn’t miss any liquids that I can see. Yes it is a thick batter. I had to scoop into each pan. I probably should put that in my post! Where can I find pat fiber? You can get it online through amazon or the thm store or vitacost, I believe! On your revised, you said you didn’t use coconut flour. So did you use the oat fiber or was it just almond flour? I was wondering what you thought a good replacement for the sour cream would be? I’m thinking canned coconut milk or apple sauce? Could you freeze pieces of this? Yes, I just ate a piece frozen and it was delicious! Hello! This looks amazing! What is the nutrition info? I haven’t but I would try! Bake at the same temp but maybe for less time… 15 minutes and then check. Oh, that is a good idea!! I made it and was in love at first bit! Has become my favorite! I am thinking of making it into cupcakes next time. Thank you so much Sarah! Yay so happy to hear this!! Hmmm I’m thinking the flatness had to do with the Wheh but I’m not 100% sure. I hav the same result. Very thin layers. I followed the recipe too. And it’s not white. Kind of light brown? I have the same result. Very thin layers. I followed the recipe too. And it’s not white. Kind of light brown? The layers are thin… not too thick. As far as the color… that would depend on the type of almond flour you use. If you use the meal it can be more brownish. I use really fine almond flour. This looks great! What kind of almond flour do you prefer? My cakes always end up mealy like cornbread rather than cake like! Thanks! I use whatever I can find on sale! Honeyville blanched almond flour. It can be mealy if you use an almond meal which is much courser. Sub for almond flour? Please and thank you! Are the almond and vanilla flavors the same thing as almond and vanilla extracts? This cake looks beautiful and I’m eager to make it! Does this cake need to be refridgerated? I assume this could be made into a 9×13 cake as well? If so, for how much time? I think I would keep the temp the same & test it… then 5 minutes longer. Just made it and am wondering if I should refrigerate after making??? I did because of the frosting. Next time? I may even freeze it just to harden the frosting a bit. I too need a sub for almond flour as i am allergic to nuts. What about all coconut flour??! That would be a tough one… I am not sure exactly how much it would need. It can be done but I haven’t tried it yet. I have a question about the sweetener for the cake. Please correct me if I am wrong but I thought the gentle sweet measures the same as Truvia? I don’t have sour cream or Greek yogurt, could I possibly sub in cottage cheese blended into a cream? This looks so delicious! I think that would actually work!!! Made this for Easter. This. Was. So. Good!! Messed up by adding double the butter–but sprinkled some coconut flour in to absorb that extra liquid and increase the coconut flavor. It still turned out awesome. I can’t wait to make it again–the correct way. This. Is. A. Keeper. Thank you, Sarah!! I was pretty skeptical about this recipe, especially since I had to sub coconut flour (1/3 cup) for the oat fiber which I didn’t have on hand. I also used the recommended amount of Swerve for this recipe. This cake more than exceeded my expectations and made a wonderful Easter dessert! It was a heavy cake, but smooth and moist with a great texture. I did double the cream cheese and cut down a bit on the recommended amount of Swerve for the frosting. So good! It will be my go to base cake from now on! Thanks so much for this great recipe! I don’t have unsalted butter. Could I use salted butter and just leave out the extra salt? Also, if I make this into cupcakes, do I still bake on the same temp and how much time? Thanks! That should work just fine!…. I would probably bake at the same temp or maybe just a little less. Might be helpful if you listed the ingredients IN ORDER as a recipe should be. No worries! It hasn’t stopped the *thousands* of excited fans from enjoying your recipes! Having the ingredients in order is nice for my easily distracted brain so i can be sure i didn’t miss anything. Yes, a professional recipe lists the ingredients in order used. Many bloggers who are hobbyist seem unaware of this standard practice. It really makes following the recipe so much easier. I would assume the THM authors did not use a knowledgeable edito in their book or they would also have avoided this same maddening issue. 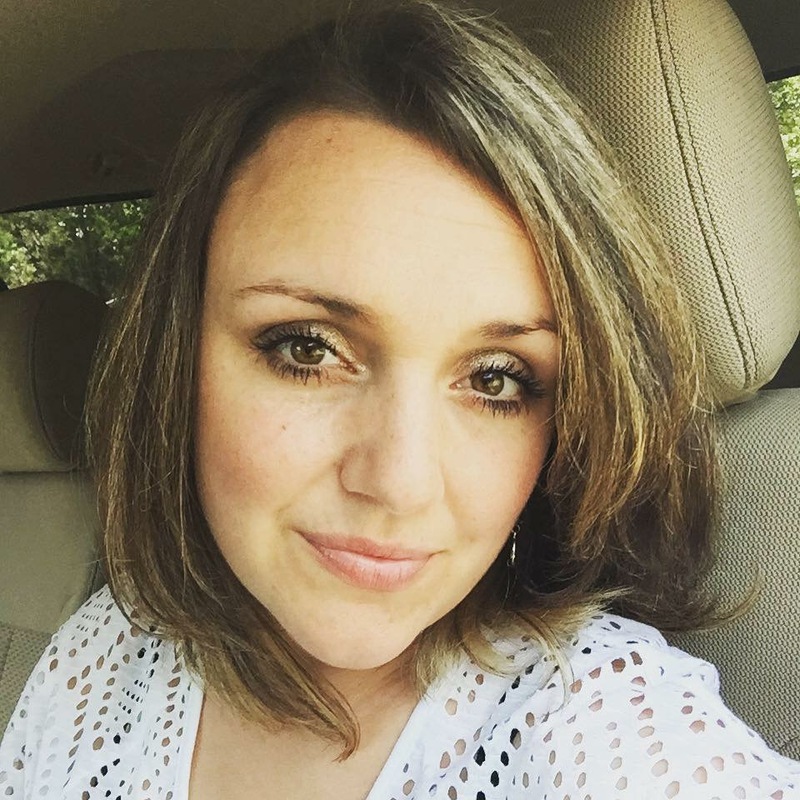 Thanks for your input… I do get really excited about my recipes and don’t think about the details but I will try to remember to put them in order from now on and go back to correct my older recipes. Sarah I love how you handle this comment. When I first read it I was like “huh”…like it’s really rude, in my opinion. Not everyone who blogs went to culinary school but they do have a knack to create delicious food. And I have tried a number of your dessert recipes and they are so tasty! 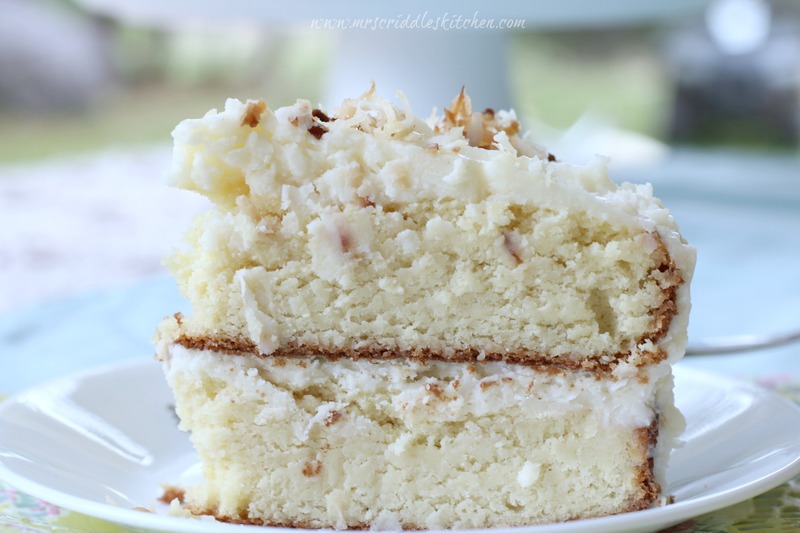 Including this coconut cake. I have been baking for years and my method most of the times is to mix wet ingredients and dry ingredients separately. Then fold them together. Not meant to be rude. Just straightforward. I have been unconventionally educated and find “notes” as they call them in the drama world, something positive for improving oneself and one’s craft. I agree – great answer, and it’s what I would have anticipated. Not all criticism is meant to be unkind, though many people see it that way. I’ll never forget at a picnic get-together one summer, the children were taking turns swinging into the water from a rope suspended from a tree. One of my children was watching and enjoying as each child took a turn and ran back to the end of the line. When the rope sung wildly once, my daughter quickly caught it as she was nearby. She immediately walked it over to the next in line to be helpful. But the person next in line started screaming at my daughter, thinking that she was cutting in line vs being helpful. I felt that you responded with harsh criticism intentionally – calling me rude when really I was trying to help. While blind adoration is great, it’s not always helpful in becoming better at what we do. I can’t imagine trying to play a piece of music by someone who enjoys writing songs as a hobbyist, but is only marginally knowledgeable about musical notation. The intent is great, but not enough. I look forward to Sarah’s recipes, but find them difficult to use the way they are written. If I were Sarah, I would be happy to learn a better way. I don’t find it offensive to learn from another. Anne – If it makes you feel at all better, I didn’t take your comment to be rude. I deal with the same issue. Also Resting B Face, so…. yeah. Hang Tough, my fellow misunderstood friend. Ohh I am so glad it worked out for you!!! It is my first THM dessert recipe and it is soooo goooood! I followed the recipe, only used 1/2 cup of coconut flour instead of oat, as it’s all I had, and I used PYURE for the sweetener. I didn’t bother with toasting shredded coconut, I just added the whole amount to the frosting. Highly recommend this recipe – the recipe was very easy to follow and instructions were clear. YAY!!! I am so happy you liked it!!! Would the icing turn out ok if I omit the shredded coconut? I have texture issues with it. No problem with the flavor in the cake base; just can’t do the shredded pieces. THANK YOU! This cake is awesome:0) I am a very picky eater, and since switching to THM, baked goods and getting texture and taste to appease my finicky tastebuds has been a challenge. Plus, my friend had given me her secret white cake recipe, but with THM it didn’t work(uses a box cake mix for base), and it was my favorite. Well, not only did you cake satisfy this picky eater, it tasted very similar to my friends secret cake, so 2 for 1 on this recipe. Also, I took this cake to Fellowship this past Sabbath, and it was a HUGE hit! Been requested to make it again. My cake didn’t turn out as fluffy as yours, and I think it’s because the eggs we get are very small, and I wonder if I should add egg whites to make up for the size difference? I would like to use all baking blend for this, I wonder if you could advice on the ratio? I haven’t tried it yet… I will see if I can work on it soon though!! For sweet blend I would use like a 1/4 a cup and then taste. Add a teaspoon at a time after that. For the Frosting I’d go with two tbsp. and then taste. Can you sub something for the coconut oil? Maybe extract? You can just use butter. I just wanted to say how incredible this recipe is. Everyone that has tried it in our house has been amazed. It is now our favourite cake for sure. I think your base recipe could easily be used to create a lemon or orange cake just by changing the flavouring and adding zest. I plan to try it next time I make it. Such an awesome recipe!! Thank you!! Thank you, Sarah! I’ m making this for my Mother’s Day dessert. I’m so excited! If you use 2 packs of cream cheese then do you add more butter? No, I just left the butter out and just used the extra cream cheese. I am confused by your instructions and want to make this for Mother’s Day. In the first step where we mix the butter, “sweetened” (shouldn’t it say “sweetener”? ), vanilla, and almond, shouldn’t we also add the softened coconut oil at this point so it can be mixed until light and fluffy? It doesn’t make sense to me to add it in with the sour cream. I would think that it would clump up. I could be wrong, but I’m just trying to understand why you don’t cream the coconut oil together with the butter. Also, are we supposed to mix the dry ingredients together first, before we add it to the butter mixture? I can’t wait to make this! Thanks, I fixed that. That was how I mixed it together. But you could probably mix the butter, oil and sweetener together just fine. Yes, mix the dry ingredients together then add to the wet ingredients. Would it be possible to make this into individual cakes in ramekins, like mug cakes? I am working on a recipe for that!!! I am a bit late to the party but I can not wait to try this cake. Your recipe for the Italian Cream cake is our favorite. This looks like a winner as well. I’ve got cupcakes in the oven and getting ready to make the frosting. Quick question: I only use THM Super Sweet blend so should I just half the Gentle Sweet amount? In other words, would 1/2 cup of SSweet be too much? That’s ALOT of sweetener! LOL! Thanks so much! Now I have bigger problems: my heavy whipping cream was bad so is there anything I can sub for that? Hmmmm….. you could probably leave it out and just add more cream cheese. Can you grind up oatmeal in the blender to use as oat fiber? No… oat fiber is a completely different thing. This looks amazing. Hoping to try it this weekend. Have you had a chance to calculate the nutritional values? I like to have that before starting when possible as it makes planning around it easier. Thank you. I haven’t yet… sorry about that! Any updates on using THM baking blend? I’m out of almond flour and need to bake it for my husband today. Would the baking blend replace the almond flour AND the oat fiber? Any help would be appreciated. No I haven’t yet… If you do replace the almond and oat fiber still try to use less because the Baking Blend absorbs much more than almond flour! How many carbs is one slice? Super Yummy!! Have you ever figured out the nutritional information ? Do you know how many net carbs per serving? This looks heavenly, I love coconut! Would this work if I used powdered pure stevia or monk fruit extracts as the sweeteners? I was wondering if the lack of bulk would effect the cake. Thanks! Used your cake base recipe and added fresh blueberries for blueberry muffins! It was awesome! Thank you! Just made this. Truly a hit. Followed it to a “t” but use 1/2 coconut flour instead of oat. Seriously one of the best low carb deserts I have found to date. It is a denser cake but great flavor. Thank you for posting. AHHHHH THIS MAKES ME SOOOO HAPPY!!! Thank you for telling me!! Could I use coconut sugar? You could… but it will make it a crossover (if you follow the Trim Healthy Mama plan). Still on plan but not an S.
It can be regular. I like the THM Gentle Sweet, though, because it is really fine and you don’t get a lot of grit. 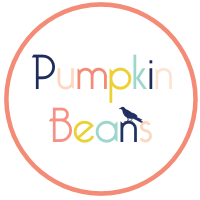 Hi, I absolutely love this recipe however I recently went dairy free. I am ok about using ghee for the butter but do you think coconut cream could be a reasonable sub for the sour cream? I will make a coconut cream frosting in place of cream cheese. Thank you! Yes, you can totally use Ghee… as far as the cream cheese… can you have goat products? They make a plain goat cheese that is really similar to cream cheese. If not… they do have a dairy free cream cheese alternative… I have not tried it yet though. The cake part is great, but I found the frosting to be way too sweet and I even added an extra 8oz of cream cheese. Next time, Ill ground the sweetener as having it crunchy was not a good feeling and will only add half of what the recipe is asking for. Thanks for posting! Is there anyway to make this a basic vanilla or white flavor? Not a huge fan of coconut. Thanks! Yep.. just leave out the coconut shreds. And make the icing without the shreds! Do you think this would do well in a 9×13, or does it need to be in rounds? I think that would work great!! You will need to bake longer… at least 30 minutes! Thank you for this recipe! I LOVE coconut! I make 1/5 of it and it makes 6 cupcakes!! My question is, how do you get your cake so white? Mine comes out much yellower than your pics? Have you tried the xylitol amounts that your recipe calls for? That seems like a lot to me. Is the coconut oil refined or unrefined? Does it matter. hmmm I’m not sure… I think unrefined. Using unrefined will give the cake more coconut flavour. I just made this for our family lunch, and it was a win! I had put off making it, because so many times in the past, THM friendly cakes have just not had either a great taste or a good texture. This was great on both counts and it passed for all the family members! Thanks so much! I made the cake and it was delicious! I wonder if there is nutritional information for the cake. So I made this cake yesterday and completely blew right past the oat fiber and left it out and it still turned out amazing!! (next time I’ll put it in and see what I think) Do you refrigerate your cake? Thank so much for the recipe!! I do keep all it in the fridge. Mainly because it doesn’t have preservatives in it so it can go bad quicker. 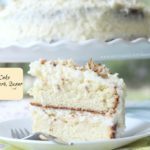 I found this recipe while searching for a keto/low carb white cake. Which is not an easy task I have tested some nasty recipes! Since coconut was not the flavor I was looking for I skipped the coconut oil and used butter only. I did use the oat fiber as directed. I baked in 7” pans they were fairly high layers, they did take longer to bake naturally. I patiently waited for it to cool! I made my own cream frosting and filling using whipping cream, cream cheese, extracts and sweetener. In the filling I added sugar free raspberry jam. It was delicious! So I stacked the cake and allowed to cool. The flavor is excellent. The texture is a bit odd. Gritty, grainy, mushy- but just a touch. I think that may be the oat fiber- i have never baked with it before so I am not sure what I should try to remedy that. The second day the texture seemed a bit better. Kind of like an old fashioned shortcake. This reminds me of the white almond sour cream cake that I enjoyed prior to my new way to eat. Hopefully I can fix the graininess. I am wondering if I can sub half the oat fiber with half whey protein isolate. Maybe it will lighten it up. I’m so glad that it worked for you! I love the idea of using a little protein for the “flour”! I think that would work! !